In the evolving world of analysis for higher ed and non-profits, it’s apparent that a gap is widening: Many well-resourced shops are acquiring analytics talent comfortable with statistics and programming, but many others are unable to make investments in specialized talent. In this piece he uses data from two schools to show you something you can try with your own data, building a very simple predictive score using nothing but Excel. Some level of data analysis ought to be accessible at some level to every organization, regardless of technical proficiency or tools. And in fact, shops that move too quickly to automate predictive scoring with black-box-like methods risk passing over the insights available to the exploratory analyst using more manual, time-consuming methods. Multiple models in Annual Fund: Worth the trouble? The question is: Is it realistic to think that you can predict which mode is the preferred? If you can’t, why bother trying? Let’s explore that question. The Mail Model answers the question, “Who is most likely to give in response to a mailed solicitation?” The outcome variable was defined as each individual’s total giving in response to mail solicitation. The Phone Model answers the question, “Who is most likely to give in response to phone solicitation?” The outcome variable was defined as each individual’s total giving in response to phone solicitation. Alumni who have given by phone but not by mail have a median age of 47. Alumni who have given by mail but not by phone have a median age of 55. Alumni who have given via both channels are closer in median age to the by-mail-only group, at 56. The giving data is potentially biased: Perhaps young alumni tended to be solicited by phone rather than by mail, therefore that’s how they’ve given. However, it’s my understanding that in this case, no special consideration was given in the past to emphasizing one mode of solicitation over another based on any criteria such as age. Therefore, I’ve assumed that the age difference at least is real. But what besides age could possibly differentiate between the two? Nothing intuitive comes to mind. So it’s fair to ask whether the two models are different enough from each other to warrant the extra work. I can think of only one way to test it: Compare how each individual is scored in both models. If most people hold the same rank from one to the other, then both models essentially predict the same thing, i.e. giving of any sort. 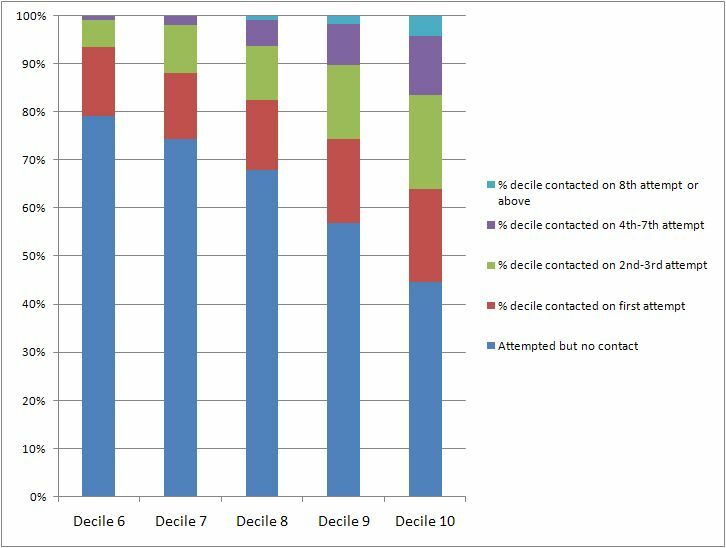 Another 27% of alumni have scores that differ by one decile (plus 1 or minus 1). Because it’s easy for an individual to get bumped from one rank to another, I will discount that difference as insignificant. Added to the alumni who didn’t move at all, a total of 48% of alumni have basically the same score from model to model. That leaves a slight majority (52%) who differ significantly from model to model. About one-quarter of alumni are predicted to have a relative preference for mail, and one quarter have a relative preference for phone. Curiously, these two quarters do NOT differ significantly in their median age — so how the two groups DO differ from each other is still rather mysterious. This exercise does not prove that two models are better than one — but I think it DOES show that they are predicting different things. I will have to be content with that for now. If it sounds as though I’m not certain about the benefits of modeling for channel preference, well — I’m not. I think more work needs to be done. As usual, your thoughts are welcome. Whether you’ve got an alumni database or strictly a donor database, as a fundraiser you face the same unknown: Which donors in your database are most likely to give at higher levels? Who should you focus your time and attention on? Who is ready to be asked to give more? Maybe much more? Unless you’re really digging into your database, the answer will remain shrouded in darkness. For example, if your primary means of segmenting your phonathon prospects is still by giving history (eg. LYBUNTs, SYBUNTs, whatever-BUNTs), then I’m telling you that you’re not learning anything you don’t already know. Predictive analytics is all about revealing patterns and relationships that we could not otherwise have known, and a predictive model is the only tool capable of distinguishing between the $20-a-year donor who might be ready to give $100, and the $20-a-year donor who isn’t. Why? Because a predictive model is based on variables that are wholly or partially independent of giving, but correlated with giving. But here’s something: Can our Phonathon model predict which donors are ready to boost their pledges? Donors who score an 8 or 9 account for another 30%. Donors with a score of 10 account for more than HALF of all increasers. So there’s yet another reason, if you needed it, for getting focused on the high-scorers in your program: They’re the ones most likely to increase their pledge year over year. I haven’t done this, but it would not be hard to build a model that specifically predicts propensity to increase. This would be especially valuable for non-university nonprofits whose databases are made up exclusively of donors. I can think of a number of ways to define the dependent variable for such a model, but a good start would be to go back a few years in order to identify a critical mass of donors who have exhibited the behaviour, and train the model on those.